At Eastside Lumber and Decking we only sell #1 Treated Pine. This provides our customers with stronger, more structurally sound treated lumber with little or no wane and fewer, smaller knots. You can see the difference immediately and it makes the construction process easier and faster, saving time and money. When you build with Treated Pine, you’re getting not only the best protection against rot, fungal decay and termite attack, but also a product that is treated with a preservative process that is SCS certified as an Environmentally Preferable Product. Treated Pine is now Arsenic Free which helps the environment by standing up to ground and water contact without the use of any EPA-listed hazardous chemicals. Treated Pine can be painted or stained to match any outdoor color scheme. High quality oil and latex-based paints and stains are recommended. Water repellent coatings can be applied to improve the weathering performance. Left uncoated or with clear water repellent coatings, Treated Pine will initially weather to a natural brown color, eventually turning gray following long-term exposure to the sun. Hot-dipped galvanized or stainless steel fasteners and fittings are recommended. Anti-corrosion coatings applied to fasteners and fittings in contact with treated wood will enhance long-term performance. Direct contact of Treated Pine with aluminum fasteners and fittings is not recommended. Due to its strength and structural integrity, Yellow Pine is the structural standard for most non-vertical framing, including the majority of roof and deck substructures. It has the ability to carry heavy loads without sagging when spanned properly. Eastside Lumber and Decking only sells #1 Yellow Pine. This provides our customers with stronger, more structurally sound framing lumber with little or no wane and fewer, smaller knots. 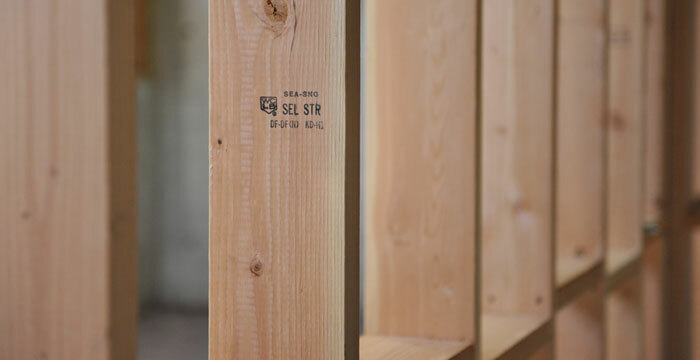 We sell select Structural Douglas Fir for framing studs due to its strength and straightness (less warp or twist). Most of our builders found that once they used Douglas Fir studs they had less waste, straightened less studs during the framing process, and saved money in man power and materials. 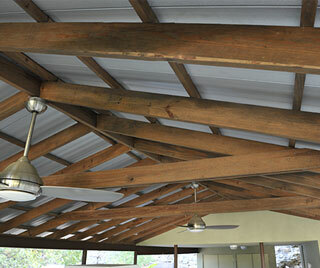 Douglas Fir beams are used industry wide for their strength and beauty. Eastside Lumber & Decking sells douglas fir beams to order. SPF (Spruce, Pine, Fir) is the industry average stud material. Industry rules allow a percentage of each type of wood per quantity sold. We carry and sell SPF but believe it is more cost efficient to pay a little more up front for Douglas Fir because, as mentioned above, they remain straight and provide better structural integrity, saving time and money in the long run. D grade pine comes from the center of the tree. It has a tighter grain and few if any knots. D grade yellow pine is used for trim (base and casing), is milled for siding, and can be stained or finished for exterior and/or interior use.